<b>STAGE FRIGHT:</b> Stephen Van Dorn (left) stars as Woyzeck and Matt Gottlieb as the Doctor who experiments on him in ETC's <i>Woyzeck</i>. Georg Büchner’s considerable reputation rests on just three plays, and none of them were produced within his short life span from 1813-1837. A politically minded German Romantic, Büchner never completely abandoned the subject of his first play, a tragedy based on the bloody historical events of the French Revolution’s aftermath titled Danton’s Death. 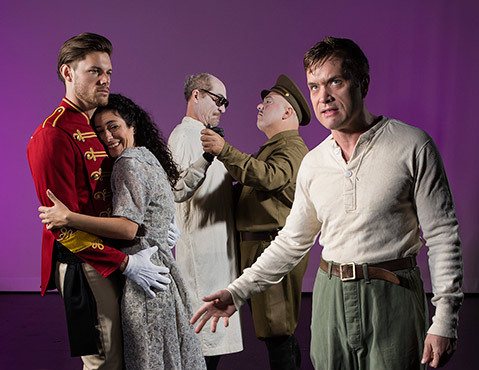 In Woyzeck, the antihero is a common soldier rather than a revolutionary; his tragedy comes at the hands of an uncaring, militaristic bureaucracy that swiftly strips him of everything he has. The nihilism of the story and the writer’s scattershot, nonlinear approach to telling it both reinforce Woyzeck’s fundamental message of generalized protest against the grinding cruelties of fate. Anticipating the tremendous difficulties that would face mankind in the 20th century, Woyzeck portrays the revenge of a man whose life is not so much thwarted as it is dissolved by circumstances beyond his control. One consequence of Büchner’s having left the play in fragments is that it has been seized on as material to be further elaborated, most famously by Alban Berg in his modernist opera masterpiece Wozzeck. This production, directed by Ensemble Theatre Company’s Jonathan Fox, represents a significant revision of the 21st-century musical version of the play that was created by Tom Waits and Kathleen Brennan in association with avant-garde theater artist Robert Wilson. The 13 new Tom Waits songs expand the original script to approximately 90 minutes playing time and operate in counterpoint to the play’s existing dialogue. Details of historical verisimilitude have not bogged down the creative team of Waits and Brennan. For example, they have no problem with Woyzeck (Stephen Van Dorn) referring to Marie (Gina Manziello) as his “Coney Island Baby” despite the setting in early-19th-century Germany. The songs are thus best understood as distillations rather than representations, artfully arranged amalgams of the carnival, the music hall, the jazz club, and the cabaret. These are strong additions to the Waits catalog, and they receive excellent performances here. Fox’s imaginative direction overcomes Woyzeck’s obstacles to narrative understanding through multiple solutions, from script to staging. Making full use of the technical and spatial potential of the state-of-the-art New Vic, this Woyzeck delivers both a brilliant reading of the Büchner text and a memorably intense night of nontraditional musical theater. The carousel at the center of the stage rotates to reveal several locations, and the catwalk above the stage provides both a place for the musicians that’s visible from the theater and a crucial vantage point for one important development late in the plot. Fine performances by Manziello and Van Dorn combine to draw the center of gravity closer than usual for Woyzeck to that of a conventional love story, but Marie’s dalliance with the Drum Major (Steven Good) cancels any expectation that the pair will create a successful home for their child together. Matt Gottlieb is suitably creepy in his heavy white makeup as the Doctor who experiments on Woyzeck, and Matthew Henerson makes for a menacing Captain. Phillip Brandon, Matthew MacNelly, and Willie Simpson provide fine voices in the service of the music, and Tiffany Story, who plays Margaret, shows a wonderful affinity for these Kurt Weill–influenced songs. François-Pierre Couture continues to excel at designing dynamic, fluid sets for the New Vic space. This one may be his best yet. Kate Bergh’s costumes are pitch-perfect blends of thrift-store archaism and military pomp. Woyzeck, despite its melancholy message of distrust for human nature, is itself a reason for hope, and a theatrical event not to be missed.